Challenge yourself and build strength in your core muscles, while you increase your balance and develop stability with the GoFit Core Wobble Board. This is an excellent way to add a new level of difficulty to any workout, including yoga or pilates. The Core Wobble Board includes an excellent training manual to empower you with exercises to increase your balance, strength, and functionality. 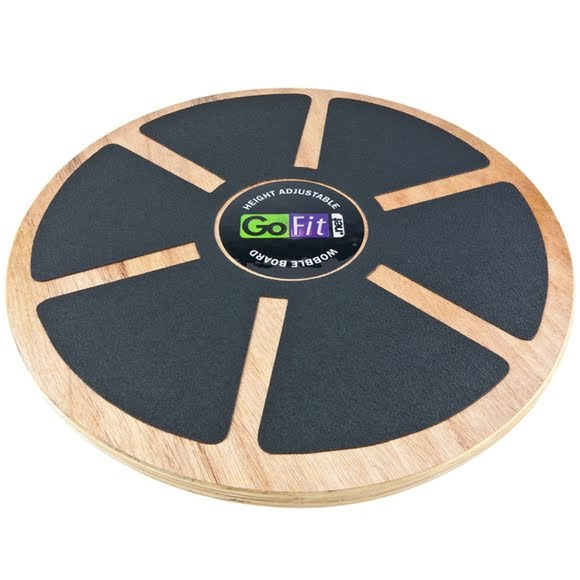 Challenge yourself and build strength in your core muscles, while you increase your balance and develop stability with the GoFit Core Wobble Board. This is an excellent way to add a new level of difficulty to any workout, including yoga or pilates. The Core Wobble Board includes an excellent training manual to empower you with exercises to increase your balance, strength, and functionality. You will feel better, have more energy and reduce pain for a more active lifestyle. Made of premium laminated hardwood, the highly-portable Wobble Board has a durable, slip-resistant surface that&apos;s easy-to-clean. The high-impact polyurethane base is fully adjustable up to 4 inches. Increase the level of difficulty as your ability improves. The higher the board, the greater the difficulty in balance and stability.